It doesn’t matter if you’re working for minimum wage or you’re the leader of one of the most powerful countries in the world—no one is immune to the charms of pizza. (Except maybe the Dalai Lama.) Check out these six stories where pizza and power overlap. 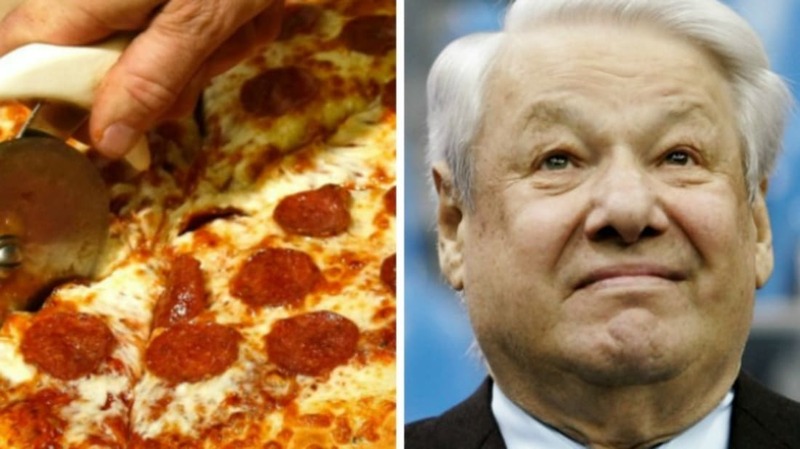 During a series of interviews with Pulitzer Prize-winning author Taylor Branch, Bill Clinton revealed that Boris Yeltsin nearly created an international incident in 1995 because he wanted pizza so badly. The Russian president was staying at Blair House, the government’s guest quarters in Washington, D.C., when he decided he wanted a late-night pie. Instead of dialing Domino’s or asking staff to procure some pizza for him, Yeltsin himself wandered out onto Pennsylvania Avenue and tried to hail a cab, clad in nothing but his underwear. Secret Service agents found him before he was able to get his pizza. Yeltsin may have still been searching for the perfect slice the following night, when he escaped from his handlers to climb into the basement of Blair House, where he was originally mistaken for an intruder. Another Russian leader raised eyebrows when he appeared in a commercial hawking food for Pizza Hut in 1997. Mikhail Gorbachev said he appeared in the ad to raise money for his Gorbachev Foundation, but also because he truly believes in the power of pizza: “It’s not only consumption, it’s also socializing. If I didn’t see that it was beneficial for people, I wouldn’t have agreed to it.” Citizens seemed less than impressed with Gorbachev’s spokesperson gig. “The next step will be to advertise Tampax,” one Russian told CNN at the time. In 2011, the Dalai Lama was doing an interview with an Australian news station. Naturally, one of the anchors thought it would be an opportune time to try a dad joke out on His Holiness: “The Dalai Lama walks into a pizza shop and says, ‘Can you make me one with everything?’” Crickets. The pun was lost in translation, although the Dalai Lama tried really hard to be gracious about it. Boris Yeltsin could have taken tips from Pope Francis, because this guy knows how to make a pizza delivery happen. Earlier this year, the Pope lamented that one of the only downsides of being il Papa is the lack of decent pizza. “The only thing I would like is to go out one day, without being recognized, and go to a pizzeria for a pizza,” he told Radio Vatican. Well, the Lord works in mysterious ways. While he didn’t get to go to an actual pizzeria, the Pope did get his wish when a pizza owner from Naples made an offering of dough and cheese to the papal motorcade. See it happen here. There’s no doubt about it—Italians obviously make fantastic pizza. But that doesn’t mean that it’s OK to mock the traditional cuisine of other countries, especially when you’re a world leader visiting said country. In 2005, Italian Prime Minister Silvio Berlusconi turned his nose up at Finnish food, saying that he had to “endure” it during his stay. A couple of years later, a Finnish chef took first place at the famous New York Pizza Show, besting two Italian chefs. Afterward, the chef named his award-winning creation “the Berlusconi.” The special topping? Smoked reindeer. Thanks to Kim Jong-il’s obsession with pizza, North Korea finally got its first pizzeria in 2009. Yes, 2009. “General Kim Jong-il said that the people should also be allowed access to the world’s famous dishes,” the restaurant’s manager said. It apparently took at least 10 years to find a recipe suitable for public consumption, because the dictator’s pizza enthusiasm began sometime back in the late 1990s, when he brought Italian pizza chefs to Pyongyang to teach army officers how to make the delicacy. It’s rumored that Jong-il himself stopped in to oversee the lessons. “I am not in the position to say whether it was really him,” one of the chefs later said. “But our chef, who had no reason to fib, was, for the space of several minutes, utterly speechless. He said he felt as if he had seen God, and I still envy him this experience."